Hoarding can be a serious problem in households because it can reduce the standard living of your family. However, it’s not simple to resolve everything if you don’t know where to start. To help you start on a clutter-free lifestyle, here is a step-by-step guide on how to clean after hoarding. Go to the grocery store and purchase a few large boxes. Use a permanent to label each box either “charity,” “sell” and “keep.” Also, prepare a lined, big garbage can into which you would dispose of things that you do not want to keep or are ready to toss. Set a fixed time limit for each session, ideally around an hour. Keep in mind not to start more than what you would finish in the allotted time. As the timer alarms, stop cleaning up and take a short break so that you do not burn out. Make piles of items on the floor which match exactly each of these marked boxes. Perhaps you might change your mind and swap a few items in some boxes later, but that is after you have had some time to consider. Keep in mind to clean one room or space at a time. Do not move on the next one if you haven’t finished the previous room. In each space, make piles of items on the ground as said earlier. Pick up each item and decide which box you should put it into or just throw it away. Place all stuff that you will need to use in an area where you can find easily. Make sure other members in your family would be aware of these items and return them back after using. Now it is time to deep clean the whole living space by scrubbing off the grime from the surfaces, repainting drywall, or removing cobwebs to make a cozy and clean room. Sort out your keep box and try to put more into the sale or charity boxes. As a rule of thumb, you should throw away anything that you haven’t used in a year. Also, those things which are still in good condition but aren’t used often should be donated to local charities. These include clothes, dishes, and other furniture pieces. Call the charity and ask them to visit your home and pick up the box. Sort through the sale box and price items for a garage sale to save you time. Try to organize a garage sale as soon as possible so that you won’t be tempted to put these items back to your home. Also, make sure to have the garbage bags picked up to the local waste facility. 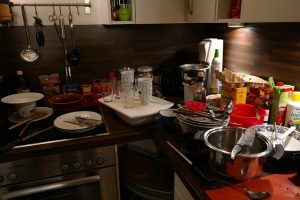 Knowing how to clean after hoarding will help your cleaning process be more efficient because you will have specific goals to meet within each room. This can help your home feel new as you’ll have more free space. A plus side is seeing many of your items being donated to those who will use them.